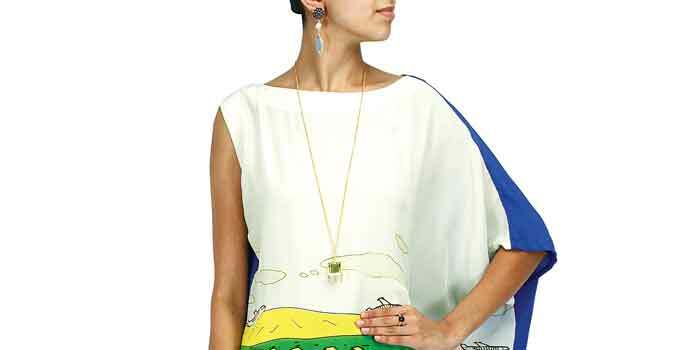 Kolkata-based couture Western wear label Vizyon is now available on chic online fashion boutique Perniaa��s Pop-up Shop, setting aside its pret-a-porter range for the web-savvy customer. a�?We have built relationships with people across the country through various exhibitions and trunk shows and wanted to make ourselves more available to them and widen our base as well,a�? begins Shradha Murarka, creative director and designer. Launched in 2007, the label always focused more on its couture line, with a a�?vision to create international staples with an emphasis on high qualitya��. Now, their ready-to-wear line follows suit with understated glamour, stylised drapes and fine finishing. a�?The brand is all about unique pieces that carry specialised detailing,a�? shares Murarka as she emphasises that, a�?Fashion is not just about wearing it, but being able to carry it off with confidence and comforta�?. And to that end, their pret lineA� features dresses, tunics and tops, with soft silhouettes, plenty of drape, and bright colours that are striking yet not too loud. a�?Our pret line is for the multi-tasking woman of today who wants to dress well and be able to transition easily from work to party wear,a�? Murarka tells us, adding that the current collection is a a�?mix of brights colours and prints that make for a fresh and vibrant range of ensemblesa�?. With colours like fuchsia, fluro-orange, indigo, neon green and yellow with floral prints, modern cuts and asymmetric hemlines spread across the racks, we couldna��t agree more. Murarka suggests you mix things up by pairing dresses with skinnies and funky accessories, or taking the tunic from beachy a�� with well-tailored shorts, to sophisticated a�� with fitted trousers and a jacket.